A fire has ravaged part of the medieval cathedral of Notre-Dame in Paris, one of France's most famous landmarks. Last night the sky in Paris was illuminated by the fire that devastated part of the medieval cathedral of Notre-Dame de Paris. This much-loved structure has stood in the heart of the city by the banks of the River Seine for some 800 years and stayed standing as wars raged around it. Now the ancient spires and the roof of the 850-year-old cathedral have collapsed, but firefighters were able to save the building’s main stone structure, including its two towers. The fire was first reported at 6.50pm local time on Monday and the building was evacuated soon afterwards. Before long the fire reached the roof of the cathedral. It destroyed the stained-glass windows and the wooden interior before toppling the spire. After nine hours the fire was finally declared to be under control. It is still not clear what caused the blaze but officials are guessing that it is linked to extensive renovation works under way. 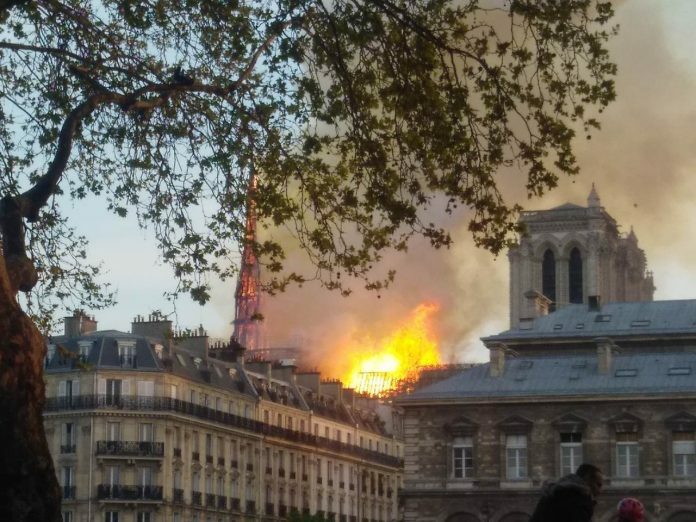 As dawn broke over the French capital, the cathedral’s blackened stone and charred scaffolding were revealed to onlookers for the first time. The incident is currently being treated as an accident but it is expected to take several days to be completely extinguished. “the whole of the roof has been devastated… a part of the vault has collapsed, the spire is no more”. said that, had fire crews not entered the building, “without doubt it would have collapsed”, French newspaper Le Monde reported. French President Emmanuel Macron appeared on television vowing to rebuild the much-loved Paris landmark. He is seeking help from the international community and is setting up a national fundraising campaign to be launched today. He called on the world’s “greatest talents” to help. Francois Henri Pinault, Hollywood actress Salma Hayek’s billionaire husband, has donated €100million (£86.2 million) o repair Notre Dame. Another €200 million has also been pledged by France’s richest man Bernard Arnault, head of the LVMH luxury goods group.